HomeDog BreedsBoston Terrier vs French Bulldog – Which Dog Is The King of Bull Breeds? 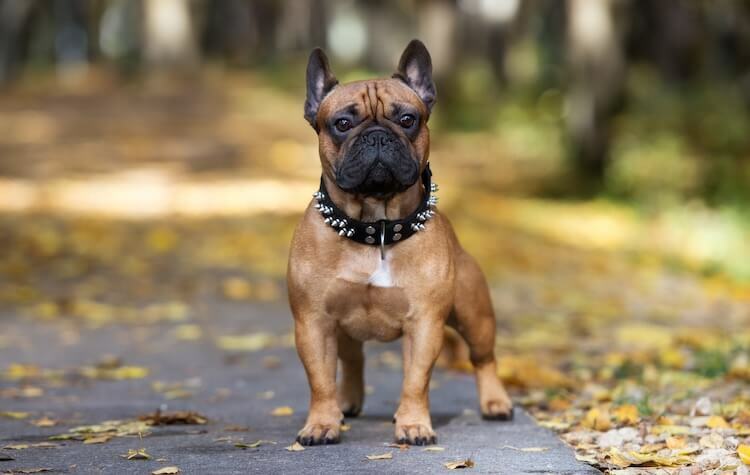 Boston Terrier vs French Bulldog – Which Dog Is The King of Bull Breeds? Looking for a new family pet, but, can’t decide between the Boston Terrier vs French Bulldog? Although these two dogs do look somewhat similar, and share similar lineage, they are very different dogs. The Boston Terrier and French Bulldog are as unique as the next dog, but, both will very quickly find their way into your heart. Both dogs whre first seen in the 1800s and have become very popular dogs in their own right. Is the bouncy Boston Terrier or the fun French Bulldog a better match for you? Read on to find out. Can you spot the difference between the Boston Terrier vs French Bulldog? A Boston Terrier is pictured above. Want to Learn More?! Grab your free PDF version of the difference between a Boston Terrier and French Bulldog. French Bulldogs were first seen in the 1800s, appearing on the streets of Paris as a cross between an English Bulldog and the local Parisian dogs. They were excellent fighting dogs because their flatter faces allowed them to bite dogs and continue to breathe, while their pointed ears meant that it was harder for dogs to bite them in retaliation. Overtime, opinions on blood sports shifted to reveal their barbarity and French Bulldogs started to become known as companion animals. They were incredibly popular with European Aristocrats, and through selective breeding, they became smaller and friendlier and thus the French Bulldog we all know and love was born. Unsurprisingly, as of 2017, French Bulldogs are the fourth most popular dog in America. 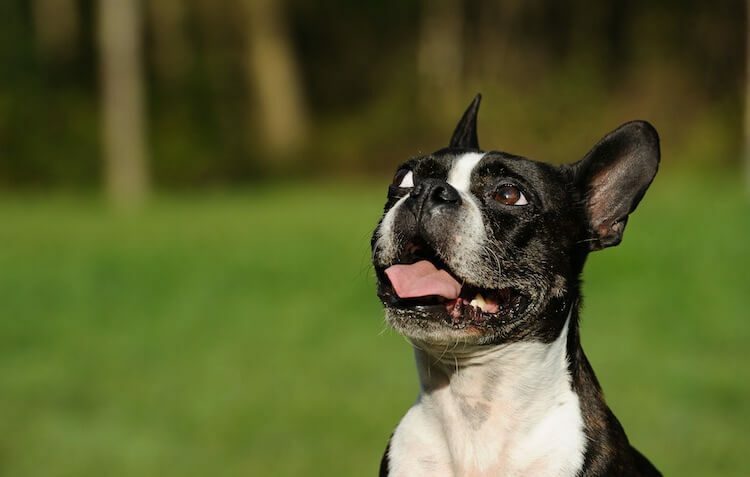 In comparison, the Boston Terrier was first seen in 1870, when Robert C. Hooper of Boston purchased a dog of unknown bull and terrier lineage and named him Judge. Judge is now known as the ancestor of all Boston Terriers. 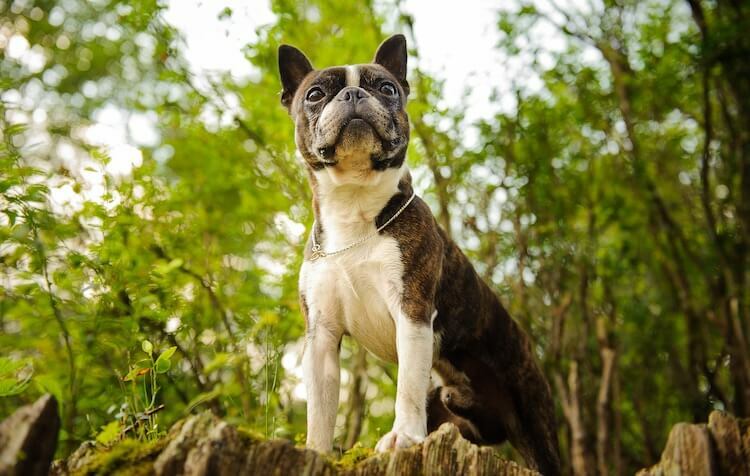 His litter was bred with French Bulldogs which provided the breed template for the Boston Terrier. By 1889 the breed was extremely popular and is one of the few dogs to have originated from America. The breed was admitted to the American Kennel Club (AKC) in 1893, six years earlier than the French Bulldog in 1898. French Bulldog puppies tend to cost between $1,500 and $3,000 USD, with the average puppy setting you back $2,200. A purebred Boston Terrier puppy usually sells in the region of $600 to $1,500 USD, but, for those puppies who can trace their pedigree to Judge, they may sell for up to $4,500 USD. When comparing the Boston Terrier vs French Bulldog price, Frenchies are twice the price of a bouncy Boston. Due to their larger price tag, both of these dog breeds are a favorite of puppy farmers. 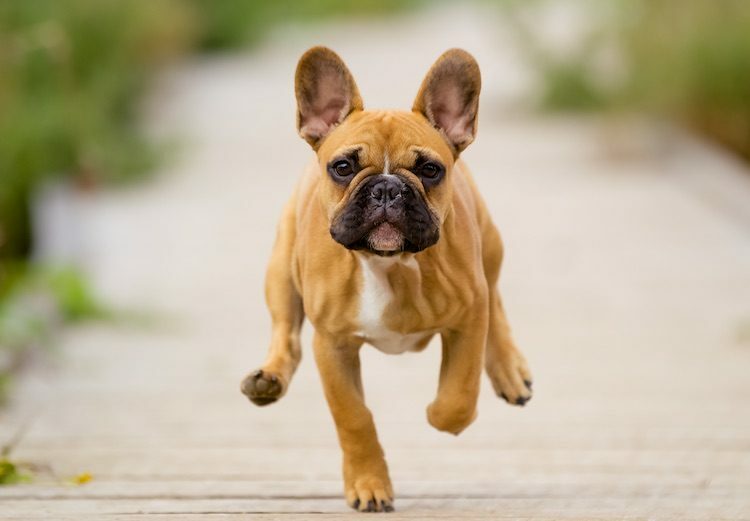 When looking to purchase a puppy, try searching on the AKC list of registered breeders, or use a pedigree website, to find a healthy French Bulldog or Boston Terrier puppy with good welfare standards who have been correctly socialized. Both the Boston Terrier vs French Bulldog are known for their larger than life personalities and zest for life. These dogs are known for their kindness and ability to get on with other pets – French Bulldogs especially. The other thing these dogs have in common is their snoring! Due to their flat faces, these dogs are renowned for their snoring and other noises such as wheezing. When comparing the Boston Terrier vs French Bulldog, you will probably find your French Bulldogs snores more than a Boston Terrier, but, any prospective owner of these dogs should be prepared for a noisy puppy. Boston Terriers are known for their fiercely affectionate and loving nature; likewise French Bulldogs too. A Boston Terrier is rarely aggressive, however, they would chew their way through anything to get to you. As a result, they suffer badly from separation anxiety and can be known to be quite destructive: chewing, biting and scratching. Are These Dogs Good With Families? French Bulldogs get along famously well with children and other family members, loving nothing more than a ball game in the garden. Boston Terriers dote on their families. They love all people and will take to children very quickly. Their small size is a clever disguise, they will love to play with your kids and will always be up for a run around the garden. When exercising both of these dogs care should be taken that they do not overheat as they can both suffer from brachycephalic obstructive airway syndrome… more on this later in the health review section. Like all Terriers, the Boston Terrier does like to bark, and may may do so if they are bored. Combat this by providing them with lots of physical and mental stimulation. Games should be constantly available for your dog to play. Boston Terriers are intelligent so try things like puzzle balls or hide and seek. On the flip side of this, French Bulldogs rarely bark so if you are looking for a quieter dog, this may be a good choice for you. French Bulldogs are known to get along well with children and have a relaxed temperament. Owning a Boston Terrier or French Bulldog? Boston Terrier vs French Bulldog Which Requires More Food? You might be surprised to hear when comparing the Boston Terrier vs French Bulldog from a food perspective, the French Bulldog will eat slightly more. French Bulldogs are known for their sensitive stomach, so you should avoid feeding processed food with lots of additives – if you wish to feed dry, feed a high quality, grain free dog food. Wet food is not recommended for brachycephalic dogs as they have poor teeth due to their face shape which results in a dog dental nightmare. Both Boston Terriers and French Bulldogs can do very well on a raw diet. If you wish to feed your dog raw food, you should feed about 75% meat, 15% bones and 10% organs. Vegetables are difficult to digest so they do not need large amounts of them, and they should be served in small pieces. Feeding bones will act as a natural toothbrush for your dog. Boston Terrier vs French Bulldog Which Requires More Exercise? Although these dogs may look somewhat similar, they have very different exercise requirements. While French Bulldogs are more than happy to lounge on the couch all day, Boston Terriers are deceptively active. You may spend more time coaxing your Frenchie to go “walkies” than actually walking. Once active, these dogs are more than happy to go for a potter, meeting new people and dogs is a great source of joy for French Bulldogs. However, most days they will be content to potter around the dog park at your side. 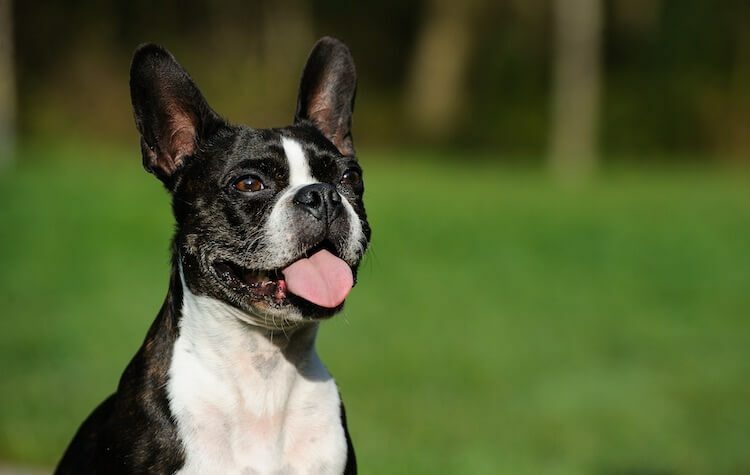 On the other hand, Boston Terriers love to run, they may bark at dogs that are a little bit bigger than them, but, realistically these dogs are all bark and no bite. Their favourite two pastimes in the world are being with their human and chasing a ball, and a walk gives the opportunity to do both. Take them somewhere like a dog park or a field and throw their ball for them. However, take cation with doing this, and make sure water is always on hand as these dogs may overheat. Walking alone will not be enough exercise for the ever-intelligent Boston Terrier. These dogs need mental stimulation as well as physical exercise. Try leaving games out for your dog to play, such as puzzle balls, or trick training during the day to harness your dog’s full potential. When training a Boston Terrier, be prepared to put up a fight. Boston Terriers are known for their stubborn nature and tenacity, and famously not doing anything they don’t want to do. On the other hand, French Bulldogs are known to be very docile, meaning they’ll do anything if you ask them nicely enough. When analyzing the Boston Terrier vs French Bulldog from a training perspective, they both respond well to clicker training due to their playful nature. Clicker training turns training into a game, and as previously discussed, these dogs like to play. Both the Boston Terrier and the French Bulldog are Brachycephalic dogs, meaning they have a flattened face. This causes a large amount of health conditions including breathing issues and an inability to regulate temperature, this is better known as Brachycephalic Airway Obstruction Syndrome. As previously mentioned, these dogs should not be allowed to play too vigorously, or exercised for too long, due to their inability to cool off. Their flatter face makes it very difficult for them to pant enough to keep their temperature down. Walks should be kept to mornings and evenings in the summer time to keep out off the hot summer sun, and play should be short – constant access to shade and water should be provided. On the flip side of this, French Bulldogs have very short fur so they may need a coat during winter walks. Their Brachycephalic face also means they have larger, more exposed eyes and therefore when comparing the health of the Boston Terrier vs French Bulldog both dogs are prone to developing eye problems in this area. The Boston is prone to hereditary juvenile cataracts, but, any good breeder should be able to test your puppy for this condition. There is also some evidence of Corneal Ulcers within the breed. Care should be taken with your dog’s eyes, and veterinary action should be taken if you perceive a problem with your dog’s vision. Due to the French Bulldog’s slim hips, these dogs cannot conceive naturally, in most cases, cannot give birth. In fact, 80% of French bulldogs give birth by caesarean section. Boston Terrier vs French Bulldog – can you spot the difference? Boston Terriers are known for their smooth fur, usually marked with black and white. They have large heads, pointed ears and a short tail. Their body is stocky and short. They are known to carry themselves gracefully. Compared against a French Bulldog, they are known for anything but grace. Their legs are short and stocky, and their body is triangular to match. They too have pointed ears and a flat face but are heavier set than Boston Terriers. French Bulldogs come in a variety of colors such as fawn, brindle, tan, black, white or blue. This can be a solid color or patches. In terms of specific grooming requirements, unlike similar dogs, these dogs do not need a lot of grooming. Neither French Bulldogs nor Boston Terriers require clipping. They do need brushing though as both the Boston Terrier vs French Bulldog shed regularly, and therefore are not suitable for allergy sufferers. Due to their brachycephalic heads, these dogs need a lot of dental work. Tooth brushing should be done regularly, at least once a month if possible, and regular visits to the vets are recommended. Nail clipping should also be done regularly by a professional, such as a groomer or veterinarian. Both of these dogs are wonderful family pets! The fabulous French Bulldog will be the crowning jewel of your family. 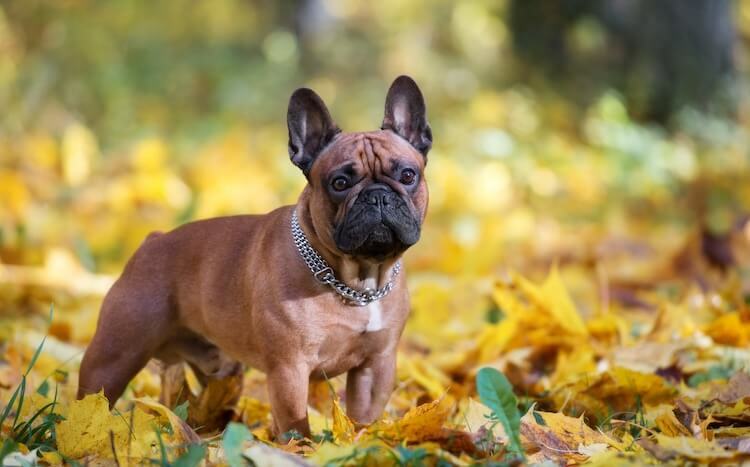 If you do go for a French Bulldog, make sure you read our perfect French Dog Names. Alternatively, the bright Boston Terrier with its intelligence and quick wit will be a wicked addition to any household. Both of these dogs are very emotive, and so they do not do well with being left alone, especially the Boston Terrier. This may be something to consider when looking to purchase one of these dogs. However, if you can’t decide between the Boston Terrier vs French Bulldog, maybe consider a cross breed such as the Frenchton: 75% French bulldog and 25% Boston Terrier, this dog is a perfect combination of the two. Do you have an opinion on either of these vivacious little dogs? Feel free to leave us a comment in the comment section below.